The Yorùbá adopted the tailored, embroidered agbádá robe after the northern Fulani Empire conquered the Ọ̀ yọ́ Yorùbá Empire during the early nineteenth century. A voluminous garment that highlights its wearer’s wealth and social importance, the agbádá is worn with matching top, trousers, and cap. Made from expensive ẹtù cloth, this oversized agbádá (or dàńdógó) is the most sumptuous type. Shot through with white silk, ẹtù’s inky blue color is achieved by repeatedly dipping threads into indigo dye before weaving. The egúngún incorporates remnants of at least two agbádá, a fitting choice for a mask that uses rich textiles to honor ancestors. Àdìrẹ is a Yorùbá textile whose patterns are made through resist dyeing. 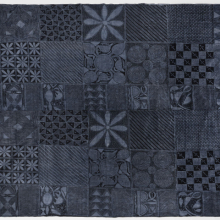 The àdìrẹ technique used to make this wrapper is àdìrẹ ẹlékọ, wherein female artists paint cassava flour paste on fabric, preventing certain areas from soaking in blue indigo dye. 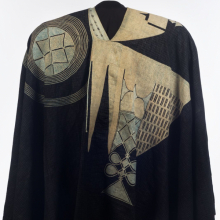 This cloth’s name is Olókun, identifiable in part by the motif of a circular “stool” surrounded by “leaves.” As goddess of the sea, Olókun’s domain is the source of wealth, lending the cloth the associated meaning “life is sweet.” Other àdìrẹ employ tie-and-dye techniques (àdìrẹ oníko), where raffia ties hold small stones or seeds in place to cover areas of the fabric during dyeing, resulting in àdìrẹ eléso patterns. One such àdìrẹ oníko was incorporated underneath a panel in the featured egúngún. While previously exhibited at the Brooklyn Museum, this egúngún has not been the focus of extensive research until now. In summer 2018, its origins were traced back to its makers, the Lekewọgbẹ family. Though no longer ritually empowered according to its community of origin, it remains a compelling symbol of belief. 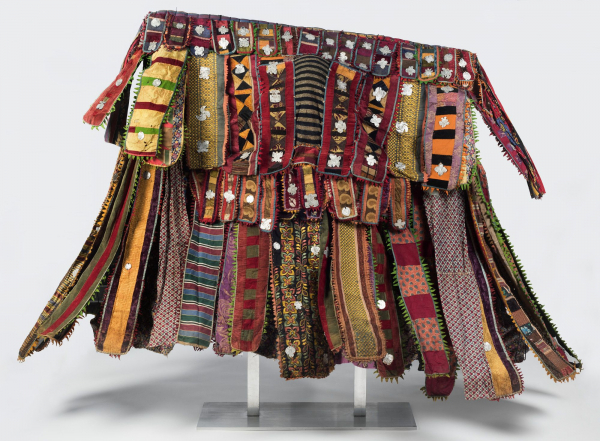 By highlighting a single egúngún, this exhibition emphasizes the global connections of African masquerades while challenging the misconception that cultural practices are static. 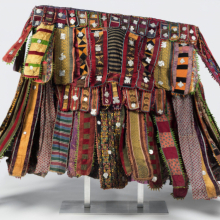 Also on view are four related West African textiles and garments; interviews with Nigerian scholars and contemporary artists; and photographs and films of egúngún festivals. A text contributed by the Brooklyn Yorùbá community brings diasporic perspective. One: Egúngún is the first Brooklyn Museum exhibition to include wall texts in English and Yorùbá. At the request of the Lekewọgbẹ family—the makers of this egúngún—this exhibition honors their family name and masquerade heritage. We thank and acknowledge them. One: Egúngún is curated by Kristen Windmuller-Luna, Sills Family Consulting Curator, African Arts, Brooklyn Museum. Each exhibition in the One Brooklyn series focuses on an individual work chosen from our encyclopedic collection, revealing the many stories woven into a single work of art. One Brooklyn is made possible by a generous contribution from JPMorgan Chase & Co. Additional support for One: Egúngún is provided by the Sills Family Foundation. Teen Apprentices host ten-minute talks about works on view. Led by Chief Ayanda Clarke, the Fadara Group showcases traditional African philosophies and ancestral legacy with dance and performance. Explore interdisciplinary methods for teaching from West African works of art.